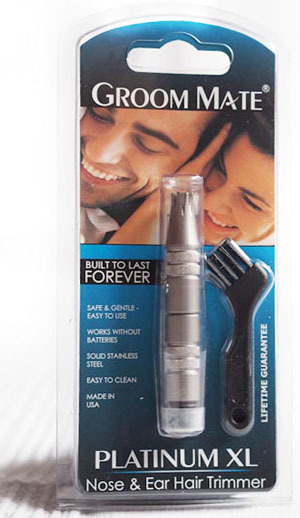 How about a personal groomer that never runs out of power, is built to last forever and is the size of your little finger? No, it’s not a pair of scissors! What a shame it’s only for ear and nose hair. It’s the Groom Mate Platinum XL, and was sent to us by the handsome and exceptionally well groomed people over at Shaver Hut. Read on as we take a closer look at this incredible groomer. Do I Have to Worry About My Nose and Ear Hair? Really, that depends on how old you are. As a lot of men start scratching their heads wondering where their hair’s going, their noses and ears start to look extra bushy. It’s not that your scalp hair made its way to your ears and nose – it’s that the tiny soft white hair that was there previously starts growing longer, coarser and darker. No one really knows why this is, but it’s assumed to be an effect of prolonged exposure to testosterone. Whatever the reason, no one likes looking at it. One answer to this problem are trimmers like the Groom Mate. I gazed with horrified delight at the giant hairs the Groom Mate removed. I’m not going to show before and after pictures of my ear and nose hair – that would involve posting close-up high definition pictures of the insides of my ears and nose. As we’ve noted – no one wants to see that. So take a look at this section of my arm. I’m a hairy fellow, and you can see the patch cleaned up beautifully by the Groom Mate in the second image. As you can see the trimmer has reduced hairs down to 1mm in length, but that 1mm is the margin of safety between the blades and you delicate innards. Some other users have found that they need to keep operating the trimmer as they remove it to avoid pulling hairs. This suggests to me that they were removing the trimmer before they’d finished trimming! I personally never felt like it was pulling hairs. The Groom Mate Platinum XL is manufactured in the United States from 100% stainless steel and comes with a lifetime guarantee. It measures 3.1 inches by 0.5 inches (78mm x 13mm) and is more discreet than a ball-point pen. 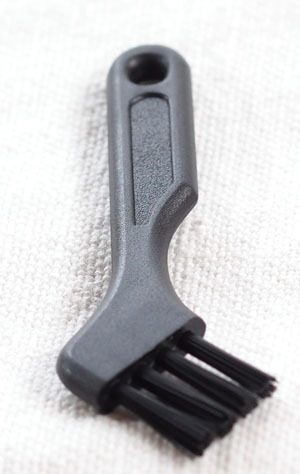 It’ll fit in your travel case or breast pocket (if you think you’ll need a quick touch-up). How can it never run out of power? Because it’s manually operated. How much territory do you need to cover in your nose and ears? Not too much we hope. Adding power to a device like this adds bulk and travel complications like hunting for adapters and worrying about different voltage levels. Instead, we have this tiny trimmer that’s as effective as its larger electric competitors. The trimmer is operated by putting the cutting end against the insides of your nose or ear, and twisting the base. This twists the blades on the other end and cuts hair. The blades are behind cutting guards that keep them well away from some the most sensitive skin on your body. The cleaning brush supplied with the trimmer has done a perfect job for me. Some other users have found that they occasionally need to disassemble the trimmer to clean it properly. The device is easy to disassemble – you just remove one small screw on the side (I committed the ultimate sin of using a kitchen knife for this) and remove the inner piece from the outer barrel. There are only two parts. Watch out for the clear grease on the inside of the trimmer shaft – remember this is built to last forever and since we have two metal pieces working together, they need grease to move smoothly. Other than that there’s no maintenance. Of course, this is perfect for travel. It’s tiny, effective and obviously works everywhere you go, no matter what kind of voltage or electrical outlets are available. The only other grooming device that meets the same criteria – a pair of scissors – absolutely can’t be taken on a flight in your carry on. The Groom Mate has no exposed points or edges to concern airport security, so you can go wherever you need and never have to worry! It’s great to see such a well conceived and well made product on the market. The personal grooming market is rapidly filling up with products that don’t last or don’t do what they’re advertised to (unless you’re willing to spend hundreds of dollars). The Groom Mate is a welcome exception to the rule, and I know I’ll be a happy user for a long time to come.